A favourite object for such treatment is the native pine tree, in which, with all its irregularity and ruggedness of growth, can be discerned the tendency to group its fisculated leaves into arched masses of foliated shape. This prevailing form supplies the conventional outline so often applied to the decoration of household objects. The gardener, in a similar way, when trimming garden trees, aims at a somewhat abbreviated expression of characteristic outlines, and seldom produces shapes violently at variance with nature. The ornamental pine tree passes through a sort of surgical treatment for the purpose of producing a shape of acknowledged beauty, as displayed in some of the finest natural trees of its species. Its branches are bent, broken, and bandaged with splints and cords, until they assume unassisted the fancy shapes desired. 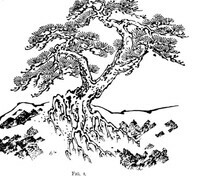 Figures 1,6,35, and 36, scattered through the text, as representative of famous wild pine trees of Japanese scenery, will suffice to show the faithful resemblance which the garden pine bears to its natural prototype. 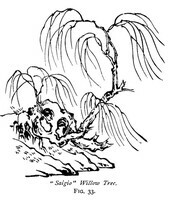 Similar examples are given in Figures 33, 37, and 40, of wild willows and plum trees exhibiting the ideal forms attributed to their species, which the gardener seeks to imitate with his handicraft. Besides the training of the branches of the pine tree, its foliage is subjected to different methods of trimming.